Kirk. Spock. Bones. Wisecracks, a villain, and some heroic space swashbuckling. 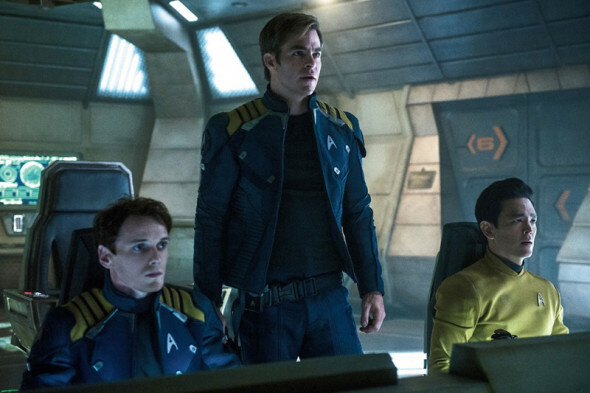 We’re pretty familiar with the Star Trek setup by now, and three flicks into the J.J. Abrams-fueled reboot, the latest seems the most comfortable in its journey. And though Star Trek Beyond doesn’t quite boldly go, it is a fun, satisfying ride. Three years into a five-year mission, the crew of the Enterprise stops for some downtime at an immense new space station. Kirk (Chris Pine) in awaiting a promotion, Spock (Zachary Quinto) is mulling a return home to Vulcan, and Bones (Karl Urban), good God, man, he has some fun needling Spock about a botched romance with Uhura (Zoe Saldana). The gang gets back in action to answer the distress call of a stranded crew, but falls into the trap of the Kahn-like Krall (Idris Elba), who’s after a very powerful artifact that Kirk just happens to be holding. Fast and Furious vet Justin Lin takes over for Abrams in the director’s chair and, working with a snappy script co-written by Simon Pegg (“Scotty”), has the film feeling like a fun Trek TV episode beamed up to the multiplex. Though the adventure is a little tardy getting its legs, things only get better as they go along. The banter is crisp, the derring-do daring, and the chemistry of the ensemble, so important in a franchise such as this, is undeniable. Spectacular only in spots, what Beyond does best is honor its own heritage while planning for the future. The nods to its TV past run from cheesy to ingenious, even finding a clever way to acknowledge the effect the entire Star Trek phenomenon has had on popular culture. After the trying-too-hard reach of Into Darkness, Star Trek Beyond strikes just the right note. More of this? I’m on board.